In Motive, the Application Settings can be accessed under the View tab or by clicking icon on the main toolbar. Default Application Settings can be recovered by Reset Application Settings under the Edit Tools tab from the main Toolbar. Sets the separator (_) and string format specifiers (%03d) for the suffix added after existing file names. Enable or disable the LED panel in front of cameras that displays assigned camera numbers. Motive persists all of the session folders that are imported into the Data pane so that the users don't have to re-import them again after closing out of the application. If this is set to false, the session folders will no longer be persisted, and only the default session folder will always be loaded. Automatically loads the previous, or last saved, calibration setting when starting Motive. Sets how Camera IDs are assigned for each camera in a setup. Available options are By Location and By Serial Number. When assigning by location, camera IDs will be given following the positional order in clockwise direction, starting from the -X and -Z quadrant in respect to the origin. Sets the default device profile, XML format, to load onto Motive. The device profile determines and configures the settings for peripheral devices such as force plates, NI-DAQ, or navigation controllers. Configures the Aim Assist button. Sets whether the button will switch the camera to MJPEG mode and back to the default camera group record mode. Valid options are: True (default) and False. Sets whether the camera button will display the aiming crosshairs on the MJPEG view of the camera. Valid options are True (default), False. Enables or disables LED illumination on the Aim Assist button behind Prime Series cameras. Controls the color of the RGB Status Indicator Ring (Prime Series cameras only). Options include distinct indications for Live, Recording, Playback, Selection and Scene camera statuses, and you can choose the color for the corresponding camera status. (Default: Red) Sets the indicator ring color for cameras when recording a capture. (Default: Black) Sets the indicator ring color for cameras when Motive is in playback mode. (Default: Yellow) Sets the indicator ring color for cameras that are selected in Motive. (Default: Orange) Sets the indicator ring color for cameras that are set as the reference camera in Motive. Enables detection of PoE+ switches by High Power cameras (Prime 17W and Prime 41). LLDP allows the cameras to communicate directly with the switch and determine power availability to increase output to the IR LED rings. When using Ethernet switches that are not PoE+ Enabled or switches that are not LLDP enabled, cameras will not go into the high power mode even with this setting enabled. Keeps the camera IR strobe on at all times, even during the playback mode. Displays various assessments of camera health over the 2D camera views, for troubleshooting performance issues. If any performance issues is detected, corresponding problem will be listed at the bottom of the 2D camera view. When enabled, renders a crosshair on top of the 2D camera views, which can be useful for camera aiming. Enables displaying masked area on the 2D camera views, in red. Enables markers selected from the 3D Perspective View to be also highlighted with yellow crosshairs in the 2D camera view, based on calculated position. Crosshairs that are not directly over the marker tend to indicate occlusion or poor camera calibration. When enabled, filtered reflections will be labeled with the corresponding object filters in the 2D camera view. 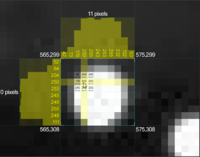 Displays 2D coordinate of the detected object centroids within the captured image, in pixels. Displays crosshairs on marker centroids in the 2D view. Displays a box around each marker, indicating its calculated edges after the birghtness threshold. Displays the roundness of an object. A value of 1 indicates maximum roundness, while a value of 0 indicates no roundness. Displays the ratio of object width to object height as a decimal, resolved to .01 pixel. Displays the area of the object in pixels, accurate to .01 pixel. Displays the pre-identified labels assigned to 2D objects for initial tracking from frame to frame. Displays X,Y coordinates for cursor location when hovering over a camera, and pixel brightness for selected pixels when a region is drag-selected. Inspecting pixel brightness can be useful during camera focusing, tuning, and aiming. Sets a maximum frame display rate for the 2D camera view. Selects the color to display in the viewport between camera panes. Enables text overlay of pertinent camera information on the 2D Multi Camera view panes. Displayed information includes image mode, time, data rate, frame ID, visual FPS, number of objects, camera serial, exposure value, threshold value, IR intensity value, internal temperature, and camera sync mode. Displays each camera’s lens distortion map. Selects the color of the lens distortion map display. Selects the transparency percentage for the lens distortion map. Selects the level of details for displaying the lens distortion. More specifically, it sets number of distortion grids on the width and height of the distortion map. Selects whether the map is shown as predistorted or distorted. 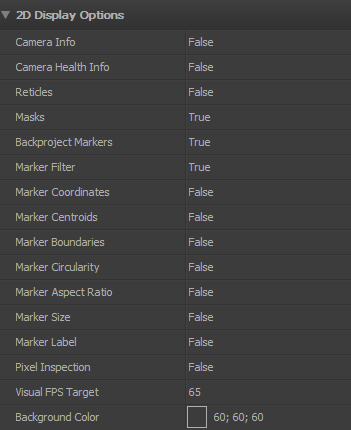 Sets levels of details for the markers displayed in the multi-camera 2D view. Available modes are Frame Buffer, Marker Centers, and Automatic LOD modes. Default is Automatic LOD. Automatic LOD switches between Frame Buffer mode and Marker Centers mode depending on the zooming of the 2D camera view, or the LOD threshold setting. Frame Buffer mode pushes the entire camera frame to the video card for scaling and display. It provides verbose information on detected reflections and centroids, but it is data intensive at the same time. Marker centers mode merely defines a white circle of the rough size and shape of the marker as it would appear. More specifically, it displays the reflections by its size and location and is significantly less hardware intensive. The distance between 2D Multi View camera panes, in pixels. The size, zoom percentage, at which the system switches between Marker Centers and Frame Buffer mode. Defines the update rate for the camera pixel data shown in the 2D camera views. The priority value ranges from 1 - 6, and a higher priority indicates a higher rate of update. Displays the camera model, serial, and master/slave status above and below camera objects. Adjusts the size of the camera name text. Setting this to true disables camera object transparency in the 3D Perspective View. Sets the color for labeled markers in the 3D view port. Sets the color for active markers in the 3D viewport. Sets the color for Unlabeled markers in the 3D view port. Displays a history trail of marker positions over time. Determines whether marker history will be shown for selected markers or all markers. Displays the number of markers detected by the system as well as the number of markers selected at the bottom right corner of the perspective view. Displays marker labels for selected markers in the perspective view. Toggles camera numbers on and off in the 3D Perspective View. Determines whether marker sizes in the 3D Perspective View are represented by the calculated size or overwritten with a set diameter. Selects the background color displayed in the 3D Perspective View. Turns a gradient “fog” effect on in the 3D Perspective View. Sets the diameter in millimeters for marker sizes in the 3D Perspective View, if Marker Diameter is set to Set Diameter. Overlays the OptiTrack logo over top of the 3D Perspective View. Selects the color of the ground plane grid in the 3D Perspective View. Selects the level of transparency applied to the ground plane grid in the 3D Perspective View. Selects the size of the ground plane grid in the 3D Perspective View. Specifically, it sets the number of grids (20cm x 20cm) along the positive and negative direction in both the X and Z axis. 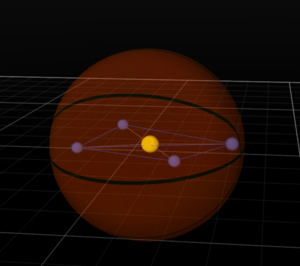 Displays the coordinate axis in the 3D view port. Controls of often scene video overlays are updated for display. Removes distortions from the grid when displaying the video distortion overlay in the reference video. Displays tracked rays in the view port. 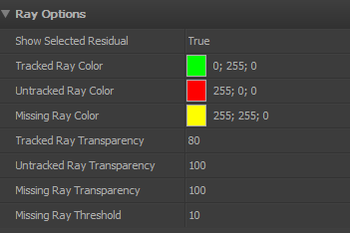 Tracked rays are marker rays with residual values less than the Maximum Residual setting from the reconstruction pane. In other words, tracked rays are marker rays that are contributing to 3D reconstructions. Displays the untracked rays in the view port. Untracked rays are the rays which start from each camera and goes through the detected 2D centroids, but fails to be reconstructed in the 3D space. When there are several untracked rays in the capture, it is usually a sign of bad calibration or extreme reconstruction settings. Displays the missing rays in the view port. Missing rays form when tracking a rigid body or a skeleton, and it indicates expected marker rays that are not detected from the camera view but expected from the rigid body or the skeleton solve. Enabling this will display distance between two markers in the Perspective View pane. Two markers must be selected to calculate the distance. Enabling this will measure an angle formed by three markers in the Perspective View pane. Three markers must be selected, and the calculated angle will follow the selection order. When all three markers are selected at once, the widest angle will be measured. Setting this to true will show marker sticks on skeleton assets for clearer identification of skeleton markers and segments in each individual actor. Setting this to true will reveal marker sticks in 3D data. When labeled, each skeleton marker is colored as defined in the corresponding markerset template. Enabling this setting will color the markers for better identification of the marker labels. Displays the offset distance between rays converging into a marker. The residual value will be displayed on top of the view pane. Note that ray information will be displayed only in the 2D data. 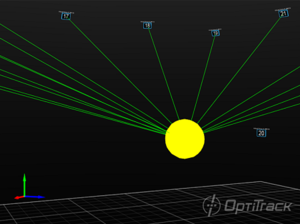 Sets the color for Tracked Rays in the 3D Perspective View. Sets the color for untracked Rays in the 3D Perspective View. Sets the color for Missing Rays in the 3D Perspective View. Sets the level of transparency for Tracked Rays. Sets the level of transparency for Untracked Rays. Sets the level of transparency for Missing Rays. Sets the distance in millimeters that a 2D marker must be from an expected location before declaring the marker missing. Toggles the theme for the timeline playback graph between light and dark. Specifies the background color for the timeline playback graph. 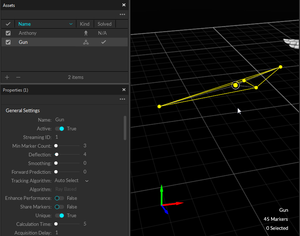 Automatically scales trajectory graphs in the Timeline pane. Overlays markers in the reference video when this setting is set to true. Overlays skeletons in the reference video when this setting is set to true. Overlays rigid bodies in the reference video when this setting is set to true. Displays reference camera distortion grid in the reference view. Keeps the aspect ratio constant for reference videos. When set to true, multiple reference view is divided into multiple columns in the reference view pane. A list of the default rigid body creation properties is listed under the Skeletons tab. Thes properties are applied to only skeleton assets that are newly created after the properties have been modified. Note that this is the default creation properties. Asset specific skeleton properties are modified directly from the Properties pane. Toggle between visible and hidden to change visibility of a newly created skeleton. Toggle between visible and hidden to change the visibility of skeleton segments from a newly created skeleton. Set the skeleton segment color for a newly created skeleton. Set the skeleton specular color for a newly created skeleton. Sets the intensity of specular colors on a newly created skeleton. Controls the strength of the glowing edge effect of the skeleton model. Sets the starting range for skeleton rim lights. Sets the ending range for skeleton rim lights. Sets the color for skeleton rim lights. Show or hide an avatar for the skeleton. Show or hide skeleton bones. Displays orientation axes of each segments in the skeleton. Displays a line between actual markers and related expected marker locations. Changes color of skeleton segments with errors. Creates the skeleton with heads upright irrespective of head marker locations. Creates the skeleton with arms straight even when arm markers are not straight. Creates the skeleton with straight knee joints even when leg markers are not straight. Creates the skeleton with feet planted on the ground level. Force the solver so that the height of the created skeleton aligns with the top head marker. A list of the default rigid body creation properties is listed under the Rigid Bodies tab. Thes properties are applied to only rigid bodies that are newly created after the properties have been modified. Note that this is the default creation properties. Asset specific rigid body properties are modified directly from the Properties pane. Allows a custom name to be assigned to the rigid body. Default is "Rigid Body X" where x is the Rigid Body ID. Enables/Disables tracking of the selected rigid body. Disabled rigid bodies will not be tracked, and its data will not be included in the exported or streamed tracking data. User definable ID for the selected rigid body. When working with capture data in the external pipeline, this value can be used to address specific rigid bodies in the scene. The minimum number of rigid body markers that must be tracked in order for the respective asset to be identified. The maximum distance, in millimeters, that a marker may deviate from its expected position before it is not considered as a part of the rigid body. Lower deflection settings force the solver to be more strict with marker positions, creating a more accurate solve but with a higher risk of gaps in the data. Higher deflection settings can allow for more continuous data, but with the potential for less accuracy in the rigid body tracking. Applies double exponential smoothing to translation and rotation of the rigid body. Increasing this setting may help smooth out noise in the rigid body tracking, but excessive smoothing can introduce a lag. Valid range is 0 to 100. Default is 0 (disabled). Compensate for system latency when tracking of the corresponding rigid body by predicting its movement into the future. The unit of the input is in milliseconds. Please note that predicting further into the future may impact the tracking stability. Tracking Algorithm determines the way rigid bodies are tracked. Auto-Select: Depending on the system camera count, Motive determines whether to use the marker-based tracking or the the ray-based tracking. For systems with fewer than 5 cameras, or the Duo/Trio Tracking Bars, ray based tracking is used. For systems with higher camera counts, marker based tracking is used. Marker Based: Standard marker based tracking. It uses 3D coordinates obtained by the Point Cloud reconstruction to solve position and orientation of the rigid body. Localizes rigid body searching algorithm. It is recommended to enable this setting for each rigid body when tracking a high number of objects. [Advanced] Allow markers of this rigid body to be used by other rigid bodies. [Advanced] Indicates that this rigid body marker arrangement is not identical to another defined rigid body. When the tracked rigid body has a unique marker placement, setting this to true can improve tracking stability. [Advanced] When enabled, this setting prevents sudden displacements, or jumps, in the position of the rigid body. 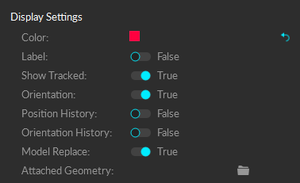 This is enabled by default to allow stable tracking. For tracking fast movements (e.g. baseball bat swing), this needs to be disabled. [Advanced] Maximum amount of time to solve the rigid body per frame (ms). [Advanced] While rigid body is untracked, only search the Point Cloud every Nth frame. This feature is used to limit rotation of rigid body assets. To use this, first create the rigid body while the object is in the desired orientation. Then set the Angle value for positive and negative rotation boundaries. After the angle value is defined, change the X/Y/Z values to 1 in order to apply the orientation constraints to only allow the axis to be oriented within the cone shaped boundaries. For example, if a 30 degree constraint is applied to Y-axis of the rigid body, rotations only up to +/- 30 degrees about the X and Z axes of the rigid body will be allowed, creating a cone-shaped allowed range of rotation with respect to the Y-axis. When the rigid body rotates beyond this boundary, the markers will be unlabeled. X component of unit vector cone of allowable orientations. No restrictions when set to 0. Y component of unit vector cone of allowable orientations. No restrictions when set to 0. Z component of unit vector cone of allowable orientations. No restrictions when set to 0. 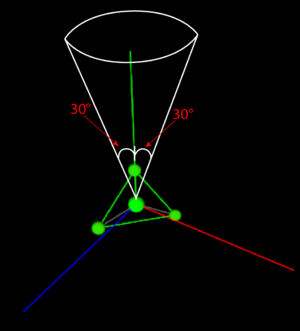 Maximum allowable angular deflection +/- of the unit cone vector (degrees). Rigid body asset display properties. Choosing color for a rigid body. Color of the selected rigid body in the 3D Perspective View. 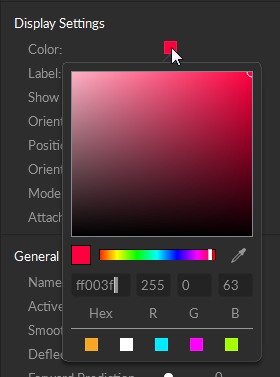 Clicking on the box will bring up the color picker for selecting the color. Selects whether or not to display the rigid body name in the 3D Perspective View. If selected, a small label in the same color as the rigid body will appear over the centroid in the 3D Perspective View. Selects whether or not to show the rigid body in the 3D Perspective View when it is tracked. Selects whether or not to show the last known position of a rigid body in the 3D Perspective View after tracking has been lost. If enabled, the rigid body will appear somewhat remain frozen in the last known position before tracking was lost, until tracking is regained. Selects whether the pivot point of the rigid body is displayed. When enabled, all markers that are part of the rigid body definition will be dimmed, but still visible, when not present in the point cloud. Enabling will turn the connecting lines between markers in a rigid body red as the distance between the markers deviates from what was defined during the rigid body creation. Enables ranking of markers and highlights those with higher residuals in red. This setting can be useful in determining marker detection quality and troubleshooting issues based on detection. Enables the display of a rigid body's local coordinate axes. This option can be useful in visualizing the orientation of the rigid body, and for setting orientation offsets. Shows a history of the rigid body’s position. Shows a history of the rigid body’s orientation. When a valid geometric model is loaded in the Attached Geometry section, the model will be displayed instead of a rigid body when this entry is set to true. Loads the OBJ file to replace the rigid body. Scale, positions, and orientations of the attached geometry can be configured under the following Default Attached Geometry section. When a OBJ file is loaded, properties configured in the corresponding MTL files is loaded as well. A OBJ file of a basketball attached to a rigid body. Adjusts the size of the rigid body pivot point. Rescales the size of attached object. Rotates the attached object in respect to the Y-axis of the rigid body coordinate axis. Rotates the attached object in respect to the X-axis of the rigid body coordinate axis. Rotates the attached object in respect to the Z-axis of the rigid body coordinate axis. Translate the position of attached object in x-axis in respect to the rigid body coordinate. Translate the position of attached object in y-axis in respect to the rigid body coordinate. Translate the position of attached object in z-axis in respect to the rigid body coordinate. Sets the opacity of an attached object. An OBJ file typically comes with a corresponding MTL file which defines its properties, and the transparency of the object is defined within these MTL files. The Opacity value under the rigid body properties applies a factor between 0 ~ 1 in order to rescale the loaded property. In other words, you can set the transparency in the MTL file and rescale them using the Opacity property in Motive. For visualizing tracking history, Position History and Orientation History must be enabled under the Display Settings section. Sets the number of frames for visualizing position and orientation history. Valid range is 1 to 1000. Default is 500. Sets the spacing, in frames, between orientation history markers in the 3D Perspective View. Increasing this value will cause the markers to appear less frequently, which can improve visualization if the object is rotating at a slower pace. Valid range is 1 to 100. Default is 5. Sets the size of the orientation history icon in the 3D Perspective View. Valid range is 1 to 100. Default is 1. Multiple marker rays contributing to the reconstruction of a marker. See Application Settings: Reconstruction Settings page for more information on each setting. Reconstruction tab contains a list of parameters for the real-time Point Cloud reconstruction engine. 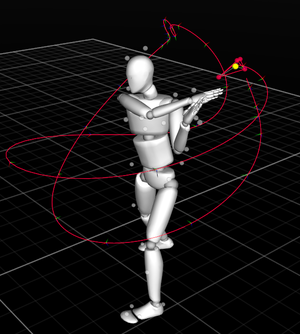 Reconstruction in motion capture is a process of deriving 3D points from 2D coordinate information obtained from captured images, and the Point Cloud is the core engine that runs the reconstruction process. The reconstruction settings in the Application Settings modifies the engine's parameters for real-time reconstructions. 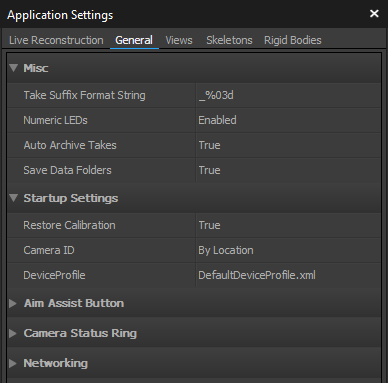 These settings can be modified to optimize the quality of reconstructions in Live mode depending on the conditions of the capture and what you're trying to achieve. Use the 2D Mode to live-monitor the reconstruction outcomes from the configured settings. Reconstruction settings for post-processing reconstruction pipelines are configured under the Take properties in the Properties pane. For details on the reconstruction workflow, read through the Reconstruction and 2D Mode page.